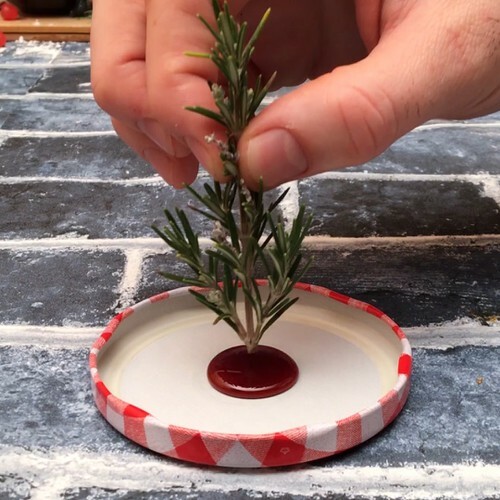 Make a thick caramel by melting down the sugar, and use it to stick the chocolate marshmallow bear, the rosemary branch and the candy cane, each onto a jam jar lid. Pour into each jam jar: 100 ml of gin, a squeeze of lime juice and 250 ml of Schweppes. Finally add a spoon of grated coconut into each one. Once the caramel has solidified, close the jam jars and shake them like snowglobes, then remove the lid when you are ready to enjoy them, cheers!